In what might be called the "war and peace corner" of the National Mall -- neighbor to the State Department, the Vietnam and Korean War Veterans Memorials, the World War II Memorial, and the Lincoln Memorial -- the new headquarters of the U.S. Institute of Peace (USIP) has taken up residence in what used to be a parking lot owned by the Navy. The LEED Gold-certified structure, designed by architect Moshe Safdie, is the first permanent home for the USIP, which was chartered by Congress in 1984 as an independent, nonpartisan center for nonviolent conflict management. The move to the new headquarters is a rags-to-riches story for the too-often disregarded agency: its previous home was the unassuming National Restaurant Association headquarters near Dupont Circle. Safdie's open, light-filled design befits an organization dedicated to the better angels of our nature -- the building, faced in acid-etched precast concrete with the warm tone of limestone and featuring two soaring atria fronted by windows and covered by a glass roof in the shape of a flying dove -- has the grandeur of a typical D.C. landmark but exhibits an airiness unusual in the stone slabs of the city's monuments. "I'm not one who believes in overt symbolism, but my sense of a building dedicated to peace was a sense of the lightness of being," said Safdie during a recent press tour of the new institute headquarters. "It should be a serene building. It should not be an aggressive building. It should be full of light." The light in the building is, in fact, the most prominent and appealing feature of the space. 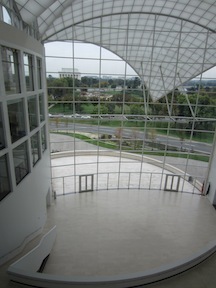 In the main atrium topped by the undulating white-glass roof called the Ansary Peace Dove, a curtain of glass overlooks the Lincoln Memorial and a curving interior wall displays three stories of offices behind rows of large windows. This space will host public programs and conferences and, in Safdie's words, "serves as a public crossroads and meeting place, underscoring the notion of the institute as a community of participants." USIP's work focuses on preventing and mitigating international conflict without resorting to violence -- in essence, helping the government handle conflicts before they escalate -- a project that involves a lot of discussion, debate, and collaboration among a diverse array of stakeholders. Accordingly, multimedia-equipped conference and presentation rooms in the new building enable high-quality international communications. The institute's charter also includes a mandate for public education, which will be conducted in the 20,000-square-foot Global Peacebuilding Center, downstairs from the main atrium. Once the building opens to visitors in 2012, the center will serve as an interactive educational resource for middle- and high-schoolers and the general public, using multimedia exhibits to explore the theme of peacemaking. More than most other structures in D.C. -- which is, after all, a city of symbolic structures -- the design of the new USIP building reflects the optimistic nature of the work that goes on within its walls and windows. Robin Wright, a current USIP Senior Fellow, believes the design creates a positive -- and even spiritual -- atmosphere in which to work for peace. Spying Safdie as he led a tour of journalists through the building, she poked her head into the conference room in which they had assembled to deliver a heartfelt homage to his work. "I love your building," she told him. "I love the light. It makes me believe in God." Katherine Gustafson, a native and current resident of the D.C. area, is a freelance writer and the author of DC Insider's Guide for iPhone and iPad. Her first print book, Change Comes to Dinner, will be published next May by Macmillan.